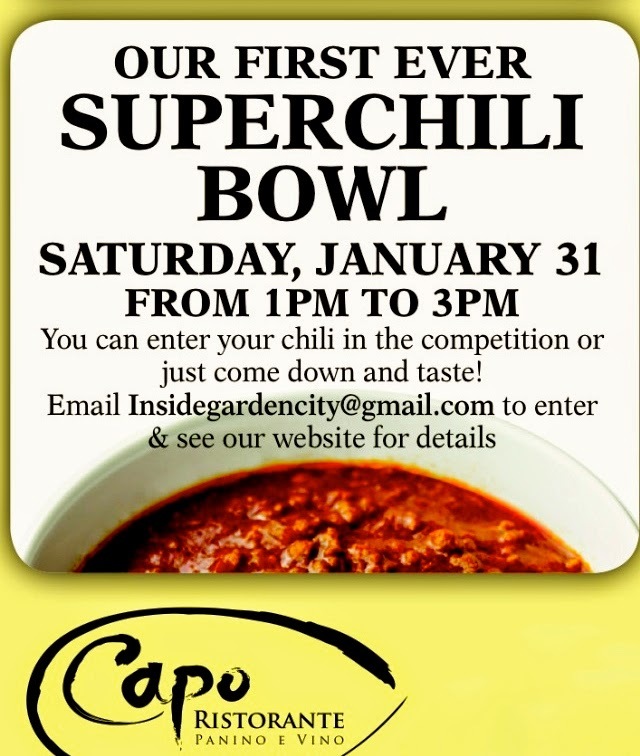 If you’re looking for a way to spice up your winter, Inside Garden City and Capo Ristorante are holding their first Super Chili Bowl on Saturday, January 31st. From 1-3pm, warm up from the inside at Capo on Covert Ave where we’ll be cooking up some fun! You can come as a taster to sample and score various chills, or be one of the competitors. Our Call For Teams is now underway. You can enter this event as an individual, a business, a restaurant or office. If you think you make a good chili, prove it! Email us at InsideGardenCity@gmail.com to enter. All you need is a name for your chili and a crockpot. The instructions are simple- cook your chili at home and bring it, fully prepared, in a crockpot to Capo on Chili Bowl day. You can use any recipe and ingredients you’d like. The only cooking rule is that the chili must be 100% homemade (no commercial chili mixes). Prizes will be awarded for first, second and third place. If competing, remember to register your chili by the January 29th due date! In addition to providing a spicy diversion from the winter blues, we will also be doing some good in the community. Proceeds from this event will be donated to the Hance Family Foundation. Chili entrants will pay $20 to compete. Those who only want to sample/vote will pay $10. $5 additional for unlimited beer, wine or soda. $5 for children. If you’re interested in stimulating your palate by being a taster, you will receive a score sheet and will grade each chili based on select criteria, such as presentation, taste and texture. So come down to the Super Chili Bowl and get some relief from the winter doldrums. I look forward to seeing you where the spice is right (womp womp). Thank you for reading http://www.InsideGardenCity.com. Please like us on Facebook.